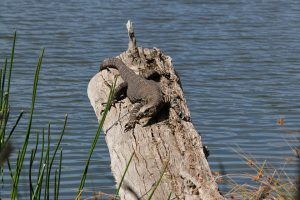 The Lace Monitor is a species of Australian lizard – a type of goanna. 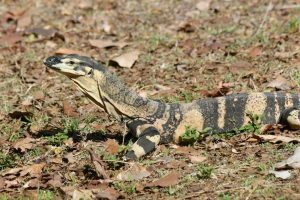 This big-sized reptile is the fifth largest lizard on earth, and the second largest monitor lizard in Australia, only next to the perentie. They are arboreal (tree-dwelling) in nature, and are mostly found active during the summer months. Size: The average length is 1.5 meters, but can grow up to 2 meters. Weight: The maximum weight they can gain is 20 kg (44 lb), though most adults are smaller. 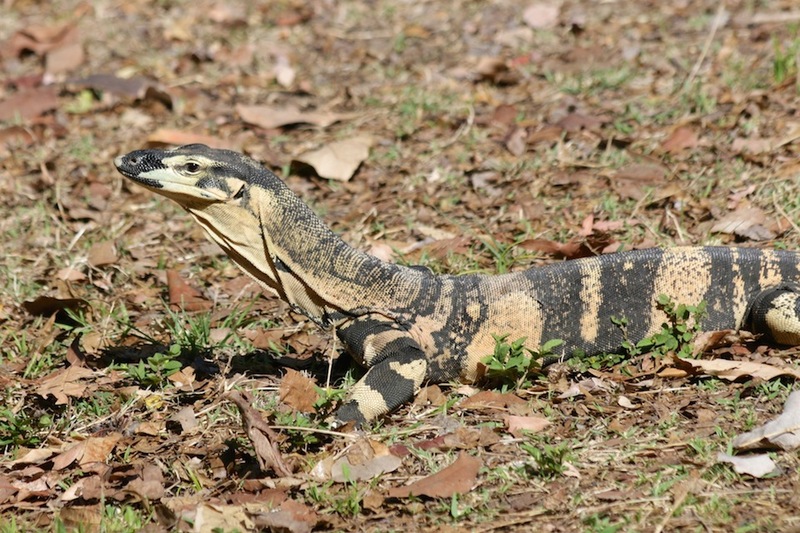 Skin/Body Color: They are found in two distinct forms, with the main form being dark grey to faded blue-black with haphazard cream spots, while the second type (known as ‘Bells’ form), found only in the dry regions of NSW and Queensland, has wide, yellow and black bands throughout the body. Feet: The four legs are strong and well-muscled, ending in strong and sharp claws. Tail: Extremely long and are almost twice the length of the creature’s head to body length. Sexual Dimorphism: The males tend to be longer than the females. Other than this, there are no visible differences between the two sexes. 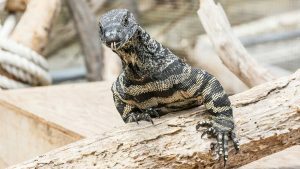 On average, lace monitors can live for 10 to 15 years in the wild; however, in captivity, their maximum recorded lifespan is around 40 years. These goannas are particularly found in eastern Australia, ranging from Cape Bedford to the south-eastern regions of South Australia. The lace monitors are mostly found in tree hollows, under fallen trees and large rocks. 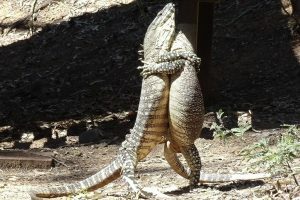 Though these lizards have two forms (by body coloration, mentioned above), no subspecies of the lace monitor have yet been classified by the biologists. 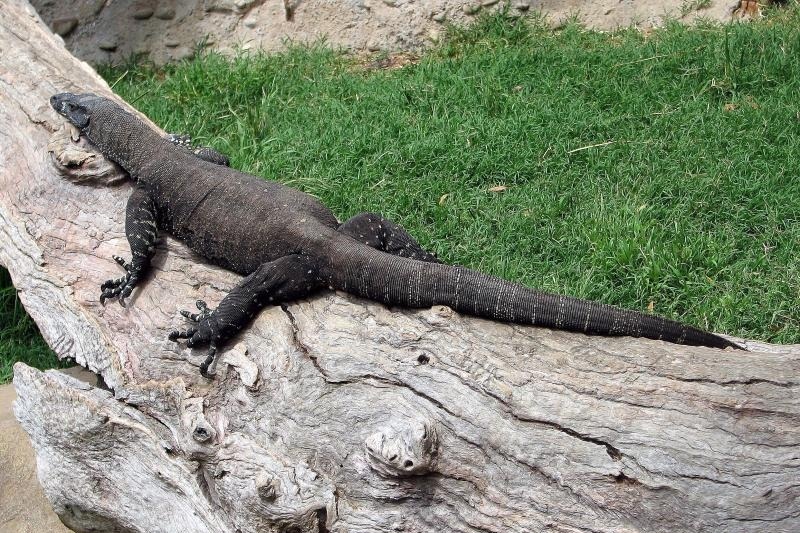 The Lace Monitors are arboreal, and their activities mostly revolve around large trees. 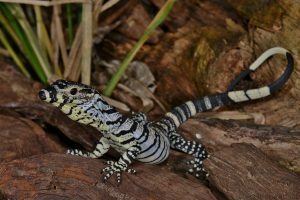 These lizards mostly seek shelter from weather extremities – too much of heat and cold – by hiding themselves in tree hollows and hollowed logs. They are primarily a solitary species, and will spend time on activities like foraging or basking all alone, except when it comes to mating. 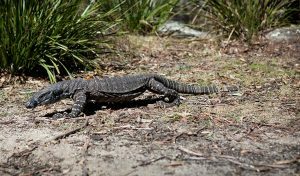 These reptiles are usually active from May to September and remain inactive during winter. 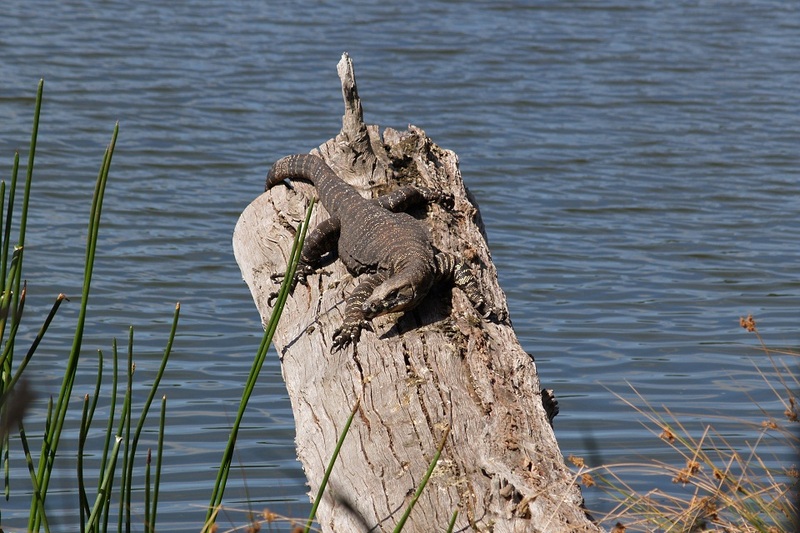 These goannas come down from trees to hunt for food and to breed. They have been seen foraging in human-inhabited areas, stealing chicken and eggs from the poultries and farmhouses. When threatened, they move with sudden speed and tend to hide themselves readily. 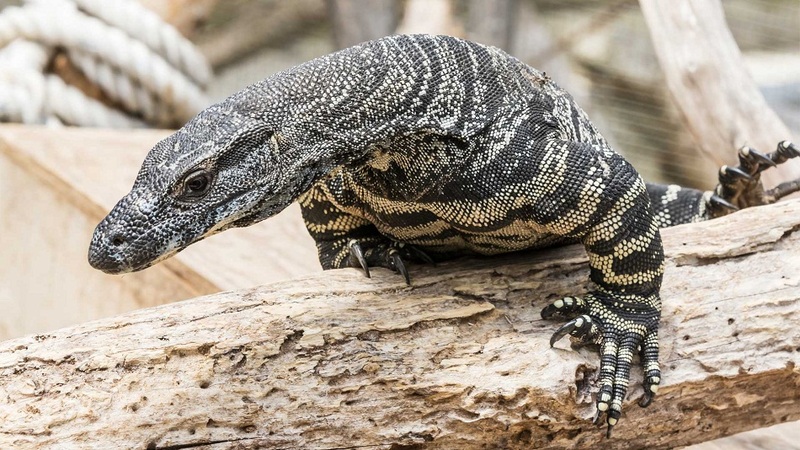 The daily food of these reptiles is typically made up of insects, various reptiles, small mammals, and birds and their eggs stolen from the nests. They would also feast upon carrion – the already dead carcasses of other animals. The males and females come together for the purpose of mating during the breeding season that falls between spring and early summer. Each year, a female lace monitor can lay anything between 6 and 12 eggs. The eggs are typically laid in termite mounds especially those that are found in trees. The mother digs a hole next to the mound, laying the eggs in it. Soon, the hole is resealed by the mites, and the eggs stay safe inside. Researchers believe that the female has the knowledge of when the eggs are about to hatch, during when it returns to the nest, opening it its claws, thus letting the young baby monitors escape. The newly-hatched offspring is about 300 mm (12 in) long, weighing about 34 g (a little more than an ounce). The juveniles are fully grown by the time they are about four to five years old, and they are ready to mate. Their spotted skin and body coloration help them camouflage themselves amid the trees at ease. Their mildly venomous bite (with the venom present in the saliva) and a forked tongue warn off predators, as well as weaken their prey before consuming. The strong, nailed claws help these arboreal creatures climb the trees very quickly, as also, appear dangerous to their enemies. 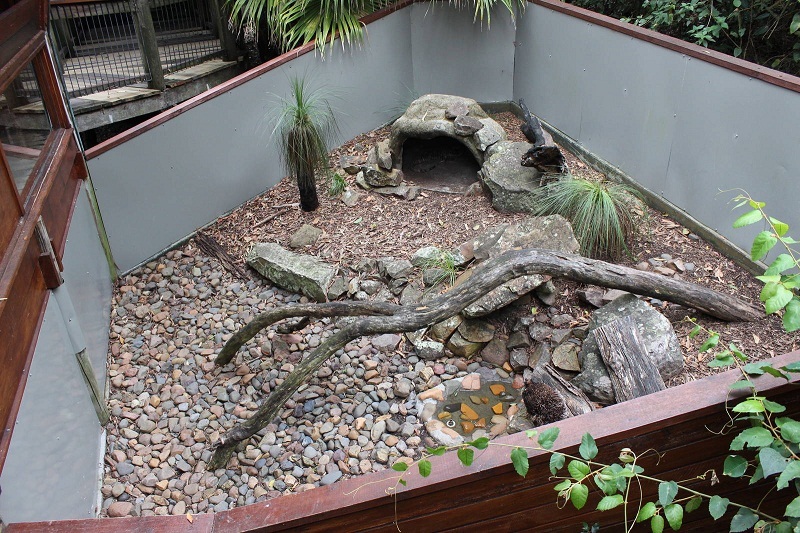 The primary predators of these lizards are the dingoes and the birds of prey. The bite of this lizard is mildly poisonous since, as mentioned, they carry poison in their saliva. Though it is not fatal to humans, but can give local skin infections or eruptions, which can easily be cured. 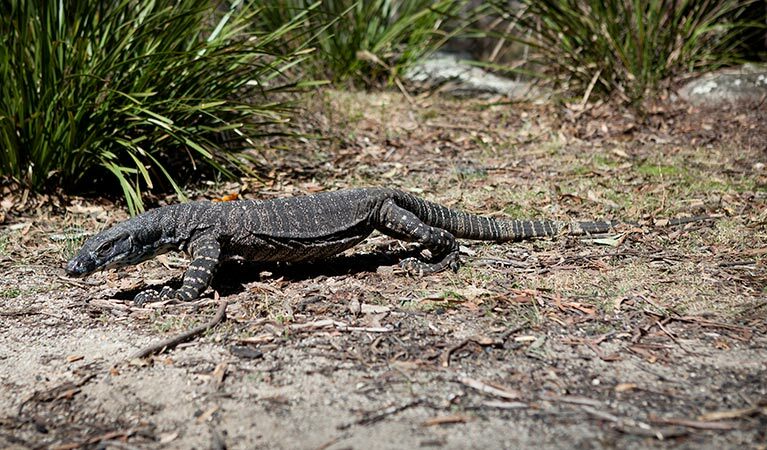 In certain areas in their range, these monitors have learned to find food in or around picnic spots, rummaging or scavenging around tables and rubbish bins. Some individuals have been seen getting used to humans and have even become tamed enough to be hand fed. 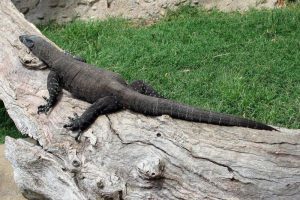 Lace monitors are solar-powered, and to gain the energy to move quickly, they need sunlight and warmth regularly in order to heat them. They can forage over distances as long as 3 km a day. These goannas were a favorite traditional food of Aboriginal peoples of Australia. Their fat was also valued for making medicines, as well as in some ceremonies.